This Kumpel's Matrix Tool v2.0 needs Visual Basic 6.0 runtime library. If you haven't installed runtime, get it from somewhere and install. There isn't registered , on Windows x64 default. The module 'C:\Windows\SysWOW64\MSSTDFMT.DLL' was loaded but the call to DllRegisterServer failed with error code 0x8002801c. is this okay, or is it a problem? You have to open the command prompt with administrator privileges. This error message happens if you’re not executing the commands under elevated (administrator) command prompt. When you do not run the command prompt in administrator mode, the user account control will prevent you from making changes to the DLL (Dynamic Link Library) files even though your account is listed under administrator group. You will not have permission on library in registry. I would suggest you to execute register dll files under elevated command prompt. a. Click on Start; Click on All Programs. c. Right click on Command Prompt and run as administrator. d. Now try registering the dll file and you should be able to do it. My god.... I tinker with the hier.him every now and again, and I think that I love this tool. I just DLed it for use on a long abandoned personal project and I'll have to say... I've been working way too hard. Thank you very much @ asheshouse, western0221, SAS~CirX and Kumpel ! Now it works on my W10! 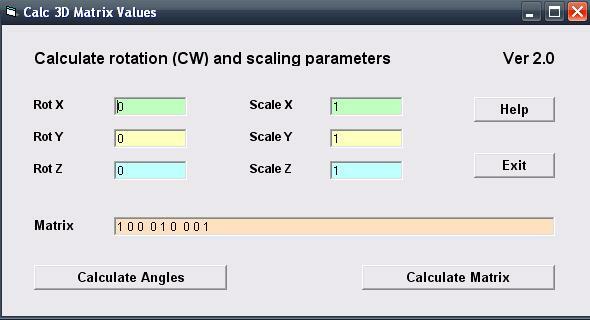 Like that Scale X 1,25 if you enter 1.25 Program crash and You must restart it again. Depends on your PC's locale. Kumpel's Matrix tool unfortunately isn't locale independent, so you have to figure out what works and what doesn't on your PC in terms of digit separator. In my case for instance, the output when I click "Calculate Angles" uses dots as separators, but I have to change them to comma when I want to convert back to matrix. Not that the program would crash otherwise, but it will just give a wrong matrix back. I click "Calculate Angles" uses dots as separators, but I have to change them to comma when I want to convert back to matrix. Absolutely same action I do.